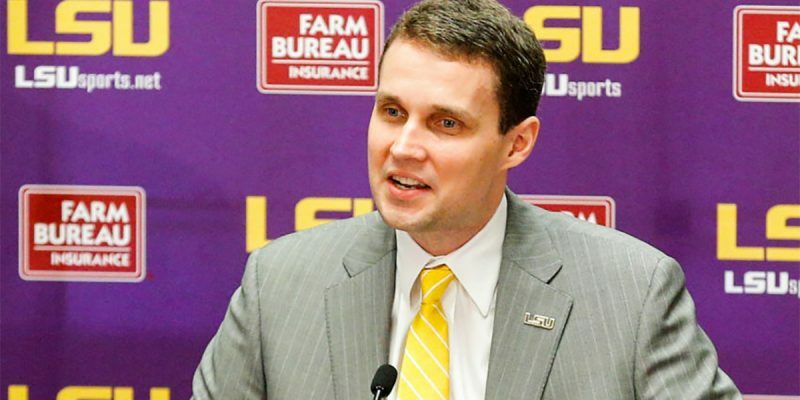 Will Wade Returns As LSU's Basketball Coach; What Should We Make Of It? Sunday some rather big news broke on the LSU campus, namely that the meeting Friday between head basketball coach Will Wade and the university’s top brass to discuss media reports from five weeks ago arising from FBI wiretaps in the Christian Dawkins-Adidas case which created the appearance Wade had committed NCAA violations in the recruitment of freshman guard Javonte Smart back in 2017 had resulted in the coach’s reinstatement. That was a result that LSU fans had been looking for virtually from the beginning of Wade’s suspension. The PR damage to the school from its fan base, and even its donor base, has been significant. It’s a somewhat perplexing press release, particularly the second paragraph – which doesn’t express a great deal of confidence and support for the coach and seems to unnecessarily inflame fan sentiment against the athletic department, something Alleva cannot seem to stop doing. One would think a better and obvious approach would have been to recognize that Wade had legitimate concerns arising from legal implications of his having been subpoenaed by the defense in the Dawkins case and he was acting on his attorney’s advice not to meet, and expressing happiness over the change in approach Wade’s new counsel Steven Thompson facilitated. That would have been a bit more descriptive of how things turned out, and it would have sounded a conciliatory tone which everybody needs given that while Wade was suspended LSU lost to Michigan State in the NCAA Sweet 16 and has seen no less than five players off the 2018-19 team declare for the NBA Draft. Three of those five, Smart, Emmitt Williams and Skylar Mays are likely to return to LSU after a look-see within the NBA draft process, but the perception of the program arising from their declarations might never have taken the hit it did. “I promise to devote all of my energy into preparing for next season and finishing the job we have started at LSU. The really interesting bit to all this is that for all the heat the suspension has created it’s fallen mostly on Alleva, which reached its peak in LSU’s final home game against Vanderbilt just a few days after Wade’s suspension when the majority of a packed-house crowd chanted anti-Alleva slogans in his presence. Since then rumors have run rampant about Alleva’s impending demise as athletic director, though he still has some 14 months left on his contract and would have to be bought out of it at a cost of some $900,000 or more. There is talk of an effort to raise the money for that buyout, though no concrete evidence it’s coming in the immediate future. And the athletic director’s notoriously poor PR skills, which showed themselves once again in Sunday’s press statement, have only fanned both the fan dislike and the rumors of his impending replacement. Except we now know Alleva wasn’t lying when he said he wasn’t the driver of Wade’s suspension. That was put forth in a Ross Dellenger Sports Illustrated story right after the unhappy spectacle (for Alleva) of the Vanderbilt game. 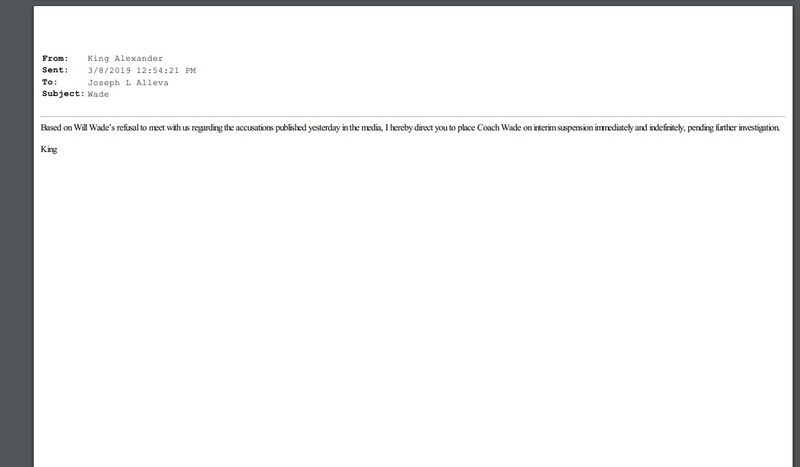 But over the weekend it was proven, it appears, by an intrepid poster on the TigerDroppings message board who actually went so far as to file a public records request for Alleva and Alexander’s emails and uncovered a message from Alexander to Alleva directing him to suspend Wade. It’s going to be interesting to see how it all works out with the internal politics at LSU now that Wade is back. Will the anticipated internecine fight between Wade and the LSU compliance department take place this summer, or has he been weakened to the point where he has to make his peace with them? And it will also be interesting to see whether Wade can effectively scramble to piece his roster back together for the 2019-20 season. It’s a good bet that he can reclaim Smart, Mays and Williams from the maws of the NBA draft, which would give him a nice core to start with for next year’s team – Smart, Mays, Williams, Darius Days and Marlon Taylor could even be a very effective, if a tad bit short, starting lineup. Add redshirts Courtese Cooper (6-9), who might be asked to fill some big shoes in the paint, and 6-5 three-point sharpshooter Aundre Hyatt, and a pair of quality guards Wade signed in the fall in 6-6 JUCO All-American Charles Manning and 6-2 combo guard James Bishop, who’s rated the No. 153 player in the country by 247 Sports, and that’s a pretty strong nine-man rotation with only one real weakness – with both Kavell Bigby-Williams and Naz Reid off to the NBA LSU is going to need another quality post player with size. So this week look for an all-out effort by Wade and his staff to reel in 6-9 superstar big man Trendon Watford out of Mountain Brook High School in the Birmingham, Alabama area. LSU was leading for Watford, rated the No. 27 player in the country by 247 Sports, before Wade’s suspension, and there is talk that with Wade back they can be again. But with less than a week before Watford is scheduled to make his commitment and sign with a college and Memphis and Alabama making inroads while Wade was out, it’s going to be a desperate fight to land him. 6-5 guard Lester Quinones out of IMG Academy in Florida, the No. 65 player in the country by 247 Sports, is another player LSU was leading for until the suspension. Memphis and Maryland have surged ahead of LSU for Quinones, but that was before Sunday – we’ll see how things look this week. If LSU doesn’t land Quinones, it could open up one of the four expected available scholarships for the spring signing period which starts Wednesday for a local product – 6-6 guard Jordan Wright out of Dunham High School in Baton Rouge. Wright, rated the No. 303 player in the country by 247 Sports, is thought to be waiting for an LSU offer before he decides on some of his other options like Georgia Tech, Minnesota, Houston and TCU. But mostly, those four scholarships will need to be used on big men. And even if Watford does come around Wade is going to need to spend at least two of them, if not three, on post players. Not to mention there is still the prospect of whatever reaction the NCAA will have down the road to that Yahoo Sports piece that started all this. But that’s a problem most fans are happy to be dealing with right now, after more than a month of crisis regarding who the basketball coach will be. Will Wade is back, and so is LSU Basketball.